There are vocal dogs and quiet dogs. 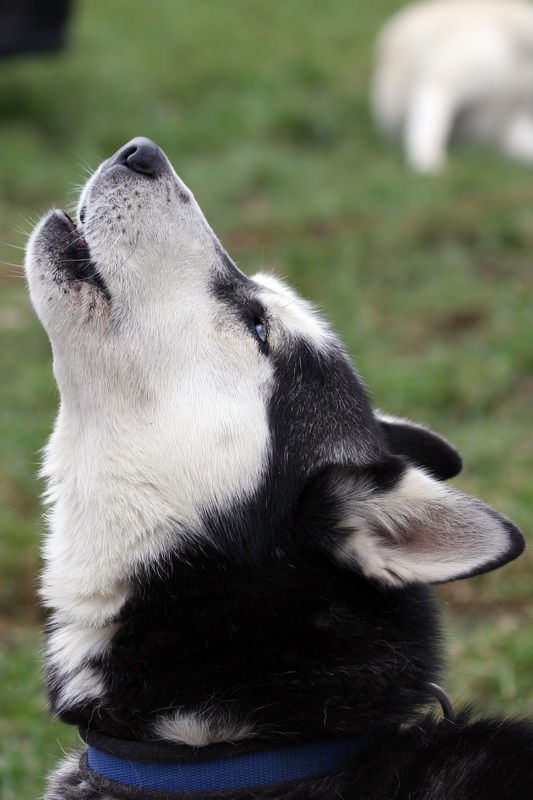 For some, barking comes naturally as a form of vocal communication but, in excess, can be quite a nuisance for the human members of their pack, as well as their neighbors. If your pooch barks incessantly when left home alone, bellows at birds and squirrels he spots outside, or becomes overly vocal when visitors arrive, a bit of proper training can help. Often, a pet parent’s immediate reaction to a barking dog is to shout at him. Unfortunately, since your dog responds to tone, he probably misinterprets your yells for barking, thinking you’re joining in on the fun. As well, your shouting may influence Fido to bark even more, as it’s a form of attention. He may even begin to bark at nothing, just to get a reaction from you. Most forms of verbal or physical discipline will be perceived as attention from his human. Once the attention stops, he will likely continue to bark assuming more attention will follow. There are many reasons why dogs bark ~ to show excitement, distress, affection, nervousness, boredom… they simply can’t express emotions the way people do, so they bark their emotions. Your dog considers barking a solution to a problem. If he barks when you leave him home alone, upon your return he thinks his barking called you back. If he barks at your neighbor taking a leisurely stroll down your street, once the neighbor is no longer in site, he thinks he successfully chased off a threat. While there are emotional factors at play, one of the main reasons these emotional factors result in boundless barking is simple ~ your four-legged friend has pent-up energy. Be sure to fulfill your dog’s mental and physical needs on a daily basis. Challenge him with brisk walks in new environments, obedience games and play time. This alone may do the trick. 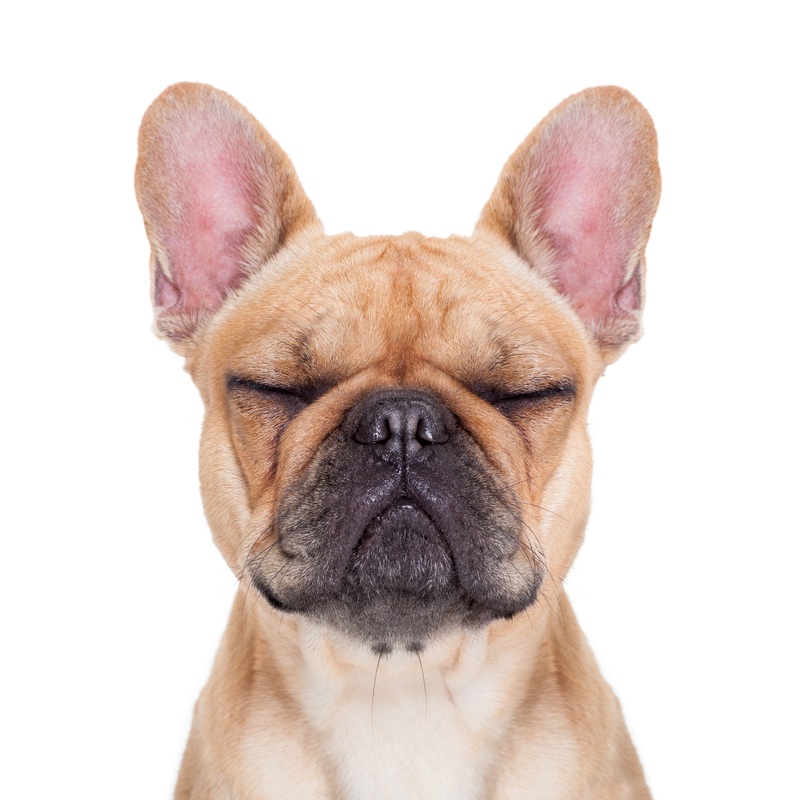 After all, more exercise = less energy = diminished desire to bark. Another possible solution is to change his belief that barking results in attention. Rather than scold or give him physical contact when he barks, silently turn your back to him and walk away. Be patient and wait as long as it takes for him to be quiet. Hopefully, he will soon learn barking is counter-productive. If your dog barks at a specific stimulus, such as other dogs or the vacuum cleaner, work to desensitize him to the stimulus. Begin with the stimulus at a distance and gradually work it closer to him, rewarding him with treats for every few feet the stimulus moves toward him. You want to teach him to equate the stimulus with something good ~ yummy treats! Repeat the process as often as it takes, and keep in mind it may take a few days or even a few weeks for the new behavior to be learned. Finally, try teaching your pooch an incompatible behavior. When he starts barking, command him to do something else. Perhaps toss a treat on his bed and say “go to bed.” Teach him to react to a stimulus that would otherwise make him bark by commanding him and rewarding him to do something else. Don’t let your dog drive you barking mad! Work with him to curb his undesirable behavior and remember, reward is the best motivator. Praise him as he does the right thing, not afterward. Hopefully this will eventually teach your dog to do the right thing next time! Pets or companion animals are really fun to have at home. Aside from providing company, they also provide protection as well as numerous other benefits. When deciding to get a pet for the family, it is important that it is done right so as not to indirectly hurt any family member as well as the pet. Here are some tips on how to go about this. Do the family members have erratic schedules? Are there times when no one is left at home? These questions should be asked because it could affect the pet you potentially buy. If the family members are always on the move, a pet that requires less maintenance should be considered. Pets like fishes and turtles, for example, don’t really need much attention and can be simply fed when the time comes. Also, cleaning schedules as well as walks for dogs or cats can sometimes be bothersome. If there isn’t anyone willing to spend time for these, it would be best not to get a pet at all. Buying a pet doesn’t mean spending a single lump sum at the start. It will take a chunk out of your monthly budget too. Food, for one, is an expected expense and will need to be stocked up on regularly. The habitat of the pet will also contribute to the overall expenses. Fishes, for example, will need aquariums with proper ventilation while dogs and cats will require separate spaces. Also, it is also worth noting that there are annual vaccinations, vet checkups, medicines and the like that will be incurred throughout your pet’s lifetime. There are also additional service fees incurred like pet grooming, schooling, daycares, fitness activities and the like. If you feel that you aren’t financially stable yet, this should be put off until you are. Is the family living in an apartment? Do you have a huge backyard? These things will matter when deciding on a pet to purchase. 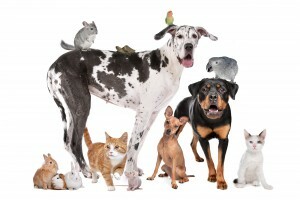 If you are in an apartment, there are certain limitations as to what pets you are allowed to have. In the event you have your own place, is there enough space for the pet to roam? If so, cats and dogs would be great. If you have confined quarters, you can consider small pets like hamsters or fishes. Considering multiple pets? You will also need to consult with the family how they feel about it. There are also challenges involved with this. Getting two dogs, for example, can result in dog fights. Multi-cat and multi-dog households each have their own challenges and these should be carefully considered prior to making the move. More often than not, the reason families get pets is to teach kids responsibility. While this can be accomplished by something as simple as a goldfish, some parents do tend to go overboard. Before purchasing anything, the kids’ allergies will need to be factored in as well as their personal interests. After all, getting them a parrot when they requested for a fish could sometimes lead to frustration, disinterest and hurt feelings. The age of the kids also needs to be considered. If you plan on getting a dog and your kid is only 2, you’ll be better off with a small dog. Likewise, kids in their teens can handle multiple pets and may even have preference for unique ones. Pets, especially ones from different owners or from pet stores and pounds, will need some time to adjust to the new neighborhood. 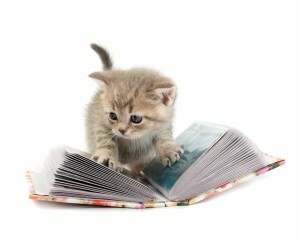 Cats, for example, can take up to two weeks to get acquainted to new environments. This is crucial in making a decision as it helps you decide on getting a newborn pet or a grown one. Choosing a family pet is a big leap for any family. Both parents and children are sure to enjoy having one or more pets. However, all the necessary factors should be considered so that both the pet and the family live comfortably alongside one another. Listing the pros and cons on a piece of paper is always a good idea. This can help the family limit the choices and make a vote easily thanks to the summary. Jordan is a writer of pet related blogs. His passion for animals is only matched by his love for ‘attempting’ to play the guitar. My Dog Is Peeing All Over My House, Help !! What Could Be Wrong and Why Is This Happening? Why is your dog peeing in the wrong places? Has your dog suddenly started to urinate in his bed, on your favorite rug or other inappropriate places around your home? While your first instinct might be to scold him for being spiteful, you just might want to stop, take a deep breath and think about why he might be doing so. Many pet parents will automatically jump to the conclusion that their dog is showing spitefulness by urinating around the home but, often times there is a deeper issue at play. One reason that a dog may urinate inappropriately around the home, after being housebroken, could be due to a urinary tract infection. There are a few factors that contribute to the likelihood of a urinary tract infection developing. A urinary tract infection is the result of an overgrowth of bacteria, fungus or even parasites. A healthy dog’s urine is acidic due to his diet of meat. This helps protect him against bacteria as bacteria will more easily thrive in urine that has become more alkaline. A grain free diet is highly suggested to keep the acid in your dog’s urine. A diet of grains promotes an alkaline environment which encourages the growth of bacteria. Other causes of a urinary tract infection are: being forced to urine for extended periods of time (not enough potty breaks), a lack of fresh, chemical free water and even antibiotics. Other than inappropriate urination in or around the home, there are other symptoms of urinary tract infections that you should be aware of. If your dog is showing signs of a urinary tract infection, seek prompt medical attention. Your veterinary doctor will perform a complete medical examination as will mostly order a series of tests, such as x-rays and a urinalysis to confirm or rule out the presence of a urinary tract infection. A high presence of Alkaline in the urine not only causes urinary tract infections but may also result in urinary crystals, cystitis and even stones. Dog Cataracts can be a scary thing to some people. As dogs transition from adult to senior status, they are susceptible to developing some health issues. Just like humans, dogs may develop cataracts in their golden years. As a pet parent, you should be aware of the symptoms and causes. As with any other health condition, early diagnosis will present your dog with the best possible prognosis. So, what is a cataract? A normal eye is made up of about 2/3 water and 1/3 protein. Sometimes, due to damage or some other biomechanical change, more protein forms in the eye. This imbalance results in a cataract. A cataract is when the lens of the eye becomes cloudy or completely opaque. There are three stages of cataracts: incipient, immature and mature. Incipient cataracts are characterized by some clouding but at this stage, your dog will not experience vision loss. Immature cataracts are characterized by a more significant amount of clouding over the lens which will impact your dog’s vision. A mature cataract is characterized by opacity and complete vision loss. Just as there are three stages of cataracts, there are three types of cataracts. When many people hear the word “cataract”, they think of the elderly however; younger dogs can have cataracts too. The first type of cataract is congenital cataracts. This type of cataract effects puppies. 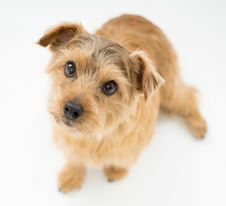 In fact, there are many breeds that are more prone to developing cataracts as a puppy. German Shepherds and Cocker Spaniels are two such breeds. If puppies are exposed to an infection or toxins before they are born, they may be born with cataracts. Sometimes though, it’s just a matter of genes as puppies can inherit congenital cataracts. The second type of cataracts, developmental cataracts, is seen in young dogs that have yet to reach the age of seven. Developmental cataracts may be the result of: injury, diabetes, toxins in the body, infection or some other eye disease. The last type of cataracts is senile cataracts. Senile Cataracts are developed late in life. No matter what type of cataract your dog has, the stages remain consistent. Be aware of your dog’s eyes. If you notice any cloudiness in the lenses of your dog’s eyes, take him for a checkup. The only “fix” for cataracts is surgery. Your vet will discuss with you the benefits and risks of this surgery and whether or not surgery is an option for your dog. Why is your dog coughing? Is your dog coughing? Whether it’s a dry cough or a moist, productive cough, you should be concerned. A dog’s cough can indicate that something is very wrong and if not treated, things could get serious, if not already. A dog’s cough is one way to help him rid his body of bad bacteria and foreign objects of particles from his respiratory tract. 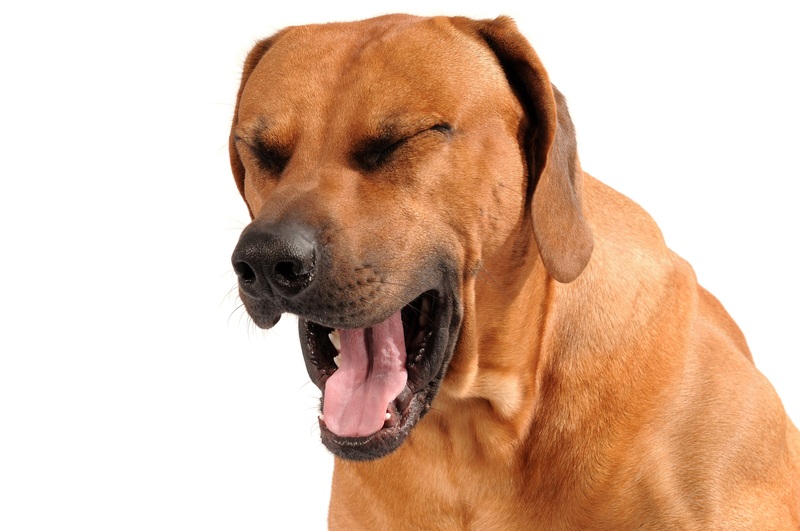 So, what is at the root of a dog’s cough? 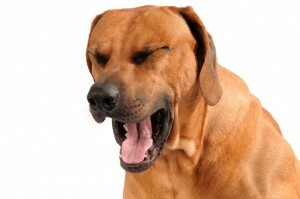 Unfortunately, it’s not quite that simple as there are many reasons your dog may be coughing. A moist cough may be indicative of pneumonia in your dog. Pneumonia is caused by an infection or it may come alongside another condition. Coughing and sneezing coupled together may be the result of influenza. If this is the case, a fever and other signs of respiratory distress may also be present. A dry, hacking cough along with yellow mucous draining from the eyes and nose are the first signs of distemper in dogs. Luckily, dogs can be vaccinated to protect against distemper and if your dog has been vaccinated, it’s not likely that he will have it. Sometimes a cough can be symptomatic of tracheal collapse. This dry hacking cough will mostly like coexist with labored breathing and gagging. Toy breeds, senior dogs, overweight dogs and/or dogs that have neck injuries are most susceptible to tracheal collapse. This happens when the cartilage of the windpipe narrows and weakens. The membranes of the trachea become inflamed as a direct result of the collapse, hence the cough. A dry hacking cough that most commonly presents itself at night as your dog tries to sleep or when there is pressure on his sternum may indicate congestive heart failure. This is the result of an enlarged heart. Also, other heart conditions can show the symptom of a cough, too. As you can see, a dog may cough for a variety of reasons. You should always seek medical attention for any cough especially if it’s chronic. If your dog is the midst of a bout of coughing, it never hurts to quickly pick up the phone as they will tell you what an emergency consists of in this situation. A cough can indicate a life threatening underlying illness, so always take prompt action. 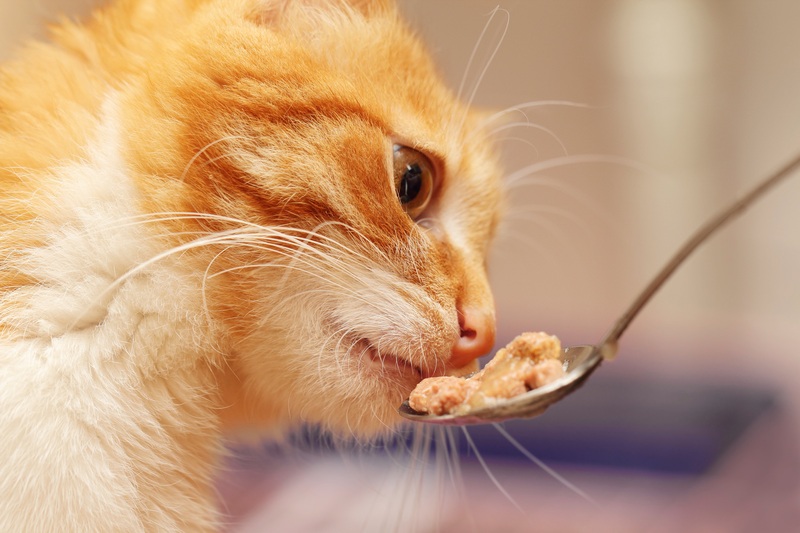 Does the food you provide your cat fulfill his nutritional needs? Not sure how to answer that very important question? Then, chances are, the answer is “no.” You see, cats require several different nutrients in their diet in order to maintain a healthy life. These nutrients include amino acids from protein, fatty acids, carbohydrates, vitamins, minerals and water. A better understanding of how your cat uses these nutrients and how much he needs is a good starting place for determining which food is best. Cats are carnivores, which means they obtain most of their protein from meat, fish and other animal products. Consider this ~ in the wild, cats hunt and kill, thus meeting their needs for protein and water. But as a domesticated pet, unless he goes out on the prowl regularly trolling for mice, he relies on you to fulfill his nutritional demands. And a diet based solely on dry kibble simply won’t do the trick. Dietary protein contains 10 essential amino acids that your cat cannot produce on his own. They are the building blocks for a healthy diet, and also assist in glucose production to provide him with energy. Amino acid deficiencies can result in serious health issues. For example, insufficient amounts of the amino acid Taurine in your kitty’s diet can cause retinal degeneration and blindness, deafness, heart disease and heart failure, a poor immune system, reproductive failure and birth defects in offspring. While it is found in abundance in animal-based proteins, Taurine is either entirely absent or present in only trace amounts in plants. Dietary fats provide the most concentrated source of energy, containing twice as much energy as protein and carbohydrates per gram. These fats supply your cat with fatty acids that play a very important role in cell structure and function, and keep your feline’s skin and coat healthy. The fact that they also make your cat’s food more tasty and appealing is just the icing on the cake! Of course, cats need energy to sustain their daily activities. While protein and fat contribute greatly, so do carbohydrates. Just like a runner who splurges on a pre-race carbo-loaded meal, your cat’s energy soars when he has carbohydrates in his diet. Major sources of carbohydrates in commercial feline fare include legumes and cereals. However, while beneficial, there is a thin line between too little and too much. It is best to select a food that has less than 10% carbohydrate calories. Diets high in carbs negatively impact the blood sugar levels of cats. D) they are highly processed, resulting in the destruction of nutrients. On the other hand, most wet foods provide a high water content, low carbohydrates, animal-based protein and are more easily digested and utilized by your cat’s body. Besides these health benefits, the variety wet foods provide keep your cat from getting bored by eating the same dry kibble meal after meal. Need help determining which wet food is best for your furry friend? Read the label on the can ~ the first ingredient should be meat. Don’t be concerned if there are no grain ingredients, and steer clear of foods with fillers like corn and rice. Remember, if cats were in charge of the commercial pet food industry, they would package meals with instructions reading “remove mouse or rabbit from freezer, thaw and serve.” Give Fluffy what he wants and needs ~ a diet of yummy, nutritious wet food. Here are some of the cats that I have helped and some of the dogs. 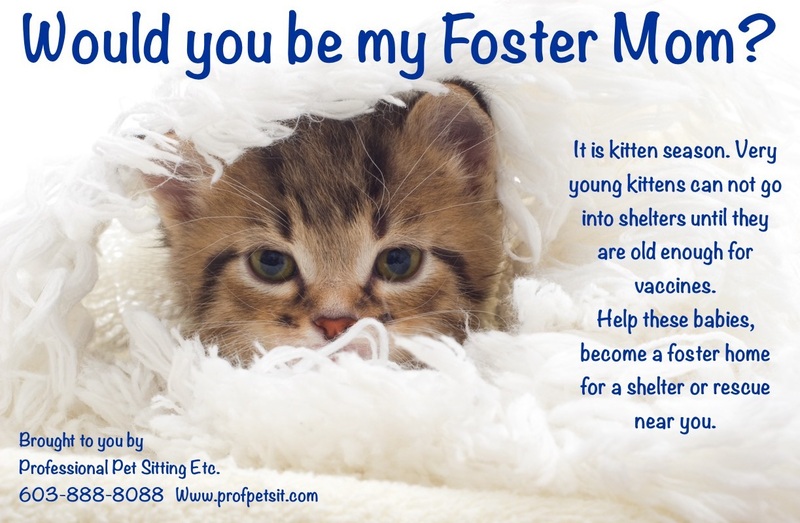 If you have ever wondered how you could help animals, fostering is one way to help many animals in need. There will always be a foster that will climb into your heart and will remain with you forever. Yes, this has happened to me. You will know this pretty quick, which will be your forever one but keep in mind that you can help many animals or just the one. Very young animal babies, pregnant Moms can not go to a shelter filled with animals that may be carrying anything contagious. Since they are too young to be vaccinated and protected, they are very susceptible. If you have a spare room, where a pregnant Mom can give birth, raise her babies until they are about 8 weeks old or if you could bottle feed orphaned babies, that would be a tremendous help. You could start their little lives out on the right foot. 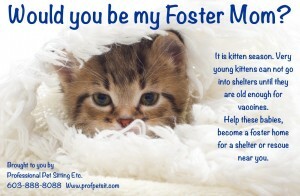 Go to a shelter or rescue near you and fill out a foster or volunteer form. Animals everywhere will thank you and you heart will be over filled with love.